Novetex created an eye-catching booth display to show their products’ potential. Approaching any market in the textile industry requires hard work and smart strategies, but the China market presents its own unique challenges, as one of the world’s largest consumer markets. 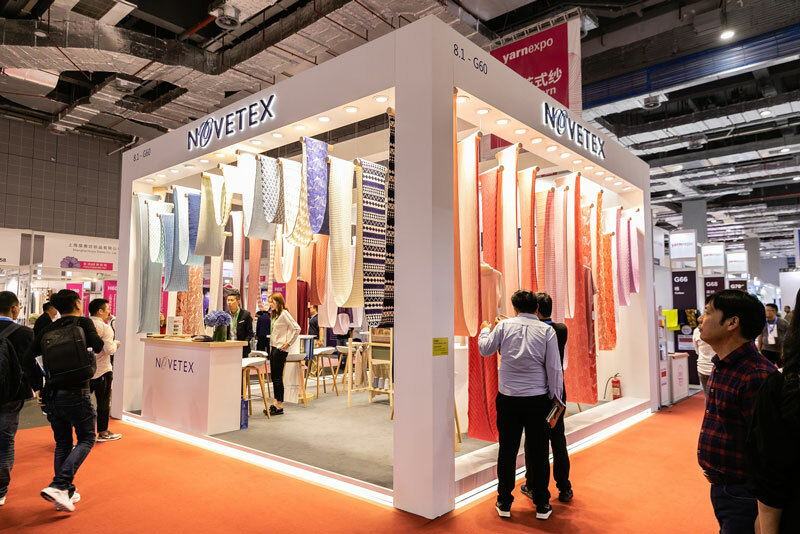 At Yarn Expo Autumn 2018, Novetex invested in their first year of participation, bringing eye-catching booth decorations to the fair. 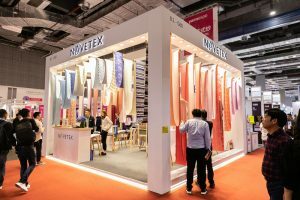 We spoke with Max Ng, Production Control Director of Novetex, to discuss potential opportunities and challenges for overseas textile companies within China, and the reasons why they identified Yarn Expo as a gateway to the China market. Messe Frankfurt (MF): Mr Ng, thank you for sitting down with us today. To begin, please could you outline your company background? Ng: China is one of the biggest consumer markets in the world, so of course there are many potential customers. Within the textile industry, consumers from western countries will spend more on their clothes, but they keep them for a long time. However, Chinese consumers will continue to buy new clothes, if they think that the deal is good, so overall they spend more. Technology is now very good in China, there are many independent fashion brands, which often have very mature e-commerce backgrounds. These smaller brands can reach their customers very directly and they have advanced warehouse systems compared to western markets, so the turnover is a bit different. So that’s why, if you have the right products and hit the right price points, there is huge potential for selling in China. Ng: The business culture is different. In China, there are three elements of business; first is the price, second is the lead time, and finally the business relationship. Our price point can be a little high for China, so we now have a range of price points, but our lead time is good because we have in-stock service. It can be difficult to penetrate larger brands in China, because they already have strong relationships and large order volumes with other companies. That’s why we target smaller labels, and as Yarn Expo is a very important sourcing platform in the Chinese market, a wide variety of domestic customers gather here, including our target group. This is a good platform to introduce our yarns to the China market. Ng: We used to attend other fairs, but as Novetex is now quite established in the western market, we were mainly meeting existing customers. Our goal at Yarn Expo is to meet new customers. We identified China as a key market, so that’s why we have come to this fair – Yarn Expo is known as a prime platform to target the Chinese market. We have had a lot of enquiries, a lot of new potential customers walking in. I would say it’s a good sign. Ng: We are still exploring this market ourselves, but I would say, if a company wants to do business in China, it’s important to not lose your brand identity. Chinese consumers respect good, strong branding and will trust these companies more. Of course, it’s also key to work on building strong relationships.